The 2018 Vikings were supposed to be really good. They were a not-at-all-unpopular Super Bowl pick, and more than one analyst I saw had them pegged as the most talented roster, 1-53, in the league. So when the team started 1-2-1, everybody preached patience. When a three-loss-in-four-weeks stretch took them to 6-6-1, people said they could still get there. When all they needed was a Week 17 win over a nothing-to-play-for Bears team to make the playoffs, it was nearly unanimous that they would. Instead, the Vikings get to watch the postseason from home, one of the most disappointing winning records (albeit at only 8-7-1) in recent history. All that adds up to a team that certainly could stand to improve in 2019 from a results perspective, but from a personnel standpoint, is in pretty good shape for a team that couldn’t make the playoffs. Still, there are some moves that would make sense. The O-line has been a perpetual problem in Minnesota in recent years. The unit finished 29th in our end-of-season rankings, with the inconsistent Riley Reiff the only lineman with an overall grade higher than 63.0. The problem for the Vikings, though, is that the team is up against it when it comes to cap space. Per OverTheCap, the Vikings have less than $7 million in cap space, third-least in the league. The big-name linemen in free agency, like Rodger Saffold and Ja’Wuan James and others, are likely to be out of the Vikings’ price range. Nsekhe, though, was just a 2018 mini-breakout lineman, without the track record that normally commands a high price tag. Bring him in for immediate help, and spend draft picks to help as much else as possible. Yeldon is one of my favorite players to find a place for this offseason. He’s good enough to be a starter in a pinch, but not someone who is likely to command the kind of salary or role of the Le’Veon Bell/Tevin Coleman/Mark Ingram class. I’ve pegged him as a handcuff for a few high-profile backs who don’t currently have high-end guys behind them, and Minnesota fits that bill. Latavius Murray is hitting free agency this offseason after a two-year stretch in Minnesota that went … confusingly. He was stuck behind Dalvin Cook on the depth chart both years but got plenty of playing time as Cook dealt with injuries. Still, he’s simply not much for the receiving game, and if Cook is going to continue to be the No. 1, the Vikings will want a guy with better receiving chops behind him. Yeldon had a poor receiving grade in 2018 but had a better 71.6 mark in 2017. He’s averaged just over 50 targets per season in his career in limited play; Murray is around 30 per year despite 500-ish more snaps. Cook is going to be the Minnesota starter in 2019. But a Yeldon as a backup would be an interesting waiver claim or handcuff if something were to happen to the starter … again. Adam Thielen and Stefon Diggs combine to make maybe the best 1-2 combination of receivers in the league, especially if Antonio Brown isn’t back in Pittsburgh. Diggs, though, hasn’t played 16 games in a year yet in his career; he hasn’t missed a lot of time, but in four seasons he’s missed nine games. And behind them is a whole lot of not much. 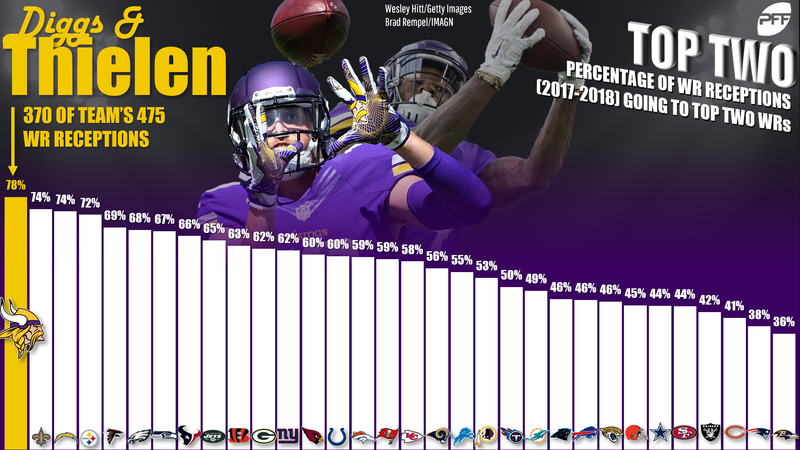 Thielen and Diggs commanded 77.9% of the Vikings’ receptions to wide receivers across the last two years, easily the highest percentage in the league. The draft pick of Laquon Treadwell has pretty decisively not panned out — his best career grade for a season is 56.4 as a rookie and it’s dropped ever since, with a total of 517 receiving yards and a single touchdown on his three-year resume. The Vikings ended up turning to journeyman Aldrick Robinson last year, hardly a long-term solution. Better to cast their lot with another rookie option who can be groomed to work behind the Thielen/Diggs combo.